The CES is committed to developing and maintaining international partnerships. These partnerships aim to support the development and promotion of evaluation worldwide while bringing new ideas and energy to the CES itself. The CES has established joint membership agreements with other national and regional associations whereby members of one association can become full members of the other association at a reduced rate and enjoy all the benefits of such membership. Agreements are in place with the American Evaluation Association, the Australasian Evaluation Society, the Aotearoa New Zealand Evaluation Association, and the European Evaluation Society. Other types of bilateral relationships are under consideration. The main international focus of the CES has been and remains in multilateral relations. The Canadian Evaluation Society is also a member of the Réseau francophone de l'évaluation whici aims to develop an active cooperation among French speaking VOPEs, to build a theoretical and technical corpus accessible in French, and to consolidate the supply of evaluations conducted and reported in French. The CES is a founding member of the International Organisation for Cooperation in Evaluation (IOCE). The IOCE regroups national and regional Voluntary Organization for Professional Evaluation (VOPEs) in the Americas, Africa, Asia, Australasia, Europe and Commonwealth of Independent States, and the Middle East. It aims to increase public awareness of evaluation and to grow evaluation globally by supporting VOPEs in contributing to good governance, effective decision making, and strengthening the role of civil society. The IOCE contributes to building evaluation leadership and capacity; advances the exchange of evaluation theory and practice worldwide; addresses international challenges in evaluation; and assists the evaluation profession to take a more global approach to contributing to the identification and solution of world problems. The IOCE is committed to cultural diversity, inclusiveness, and bringing different evaluation traditions together in respect of that diversity. Global Parliamentarians Forum for Evaluation (GPFE): vacant. EvalPartners authored the EvalAgenda 2016-2020: a roadmap to stronger and more influential evaluation. The EvalAgenda comprises four pillars: (1) the enabling environment for evaluation, (2) institutional capacities, (3) individual capacities for evaluation, and (4) inter-linkages among these first three dimensions. It is used by several VOPEs, including the CES, in reflecting and planning their action. The CES has officially declared its support with the EvalAgenda. 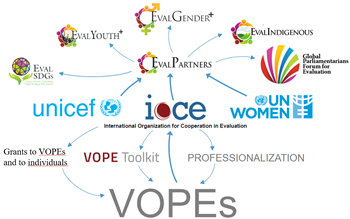 CES members are involved in all aspects of these multilateral organizations and initiatives – in EvalSDGs, EvalGender+, EvalYouth, and EvalIndigenous, in maintaining the VOPE Toolkit, in the professionalization discussion, and in the management of the IOCE and of EvalPartners.